Outernet has carved a niche by being one of the organizations trying to provide free access to information in regions which do not have internet access. The company’s name comes from the fact that the information will be beamed from satellites in space, hence Outernet (outer space). Outernet is not internet. The company focuses on distribution of information to gadgets without the need for connectivity. It uses satellites in space to beam information to specialized receivers on the ground which can store video, audio, web pages, eBooks and images. Then, devices such as smartphones, tablets and computers can use WiFi to communicate with the receivers and access the information. The company recently announced that its network has gone live over sub-Saharan Africa. In fact, it is running a crowd funding campaign on Indiegogo to raise money for the Lantern, a small pocket sized receiver. The campaign surpassed the initial targeted amount of US$200,000 in five days. The extra money raised will help the company develop an android friendly service. The company has big receivers for institutions named Pillars. The pillar has been termed as a “Library in every village” while the Lantern has been dubbed “A library in every pocket”. The company has already been approached by the World Bank and IREX in projects that will provide free information for schools in South Sudan and Namibia respectively. In South Sudan, the World Bank hopes to put up several Pillars in cities that will enable millions to access information by far more cost effective means than previously possible. IREX aims to use the technology to provide information to thousands of students in various educational projects across Namibia. But Outernet is not the only company to crack the idea of using satellite to provide information. Satellite solution company Yazmi announced the launch of its satellite powered tablet, Odyssey, which enables learners to access information broadcasted from satellite to their devices, without the need of internet, in October last year. 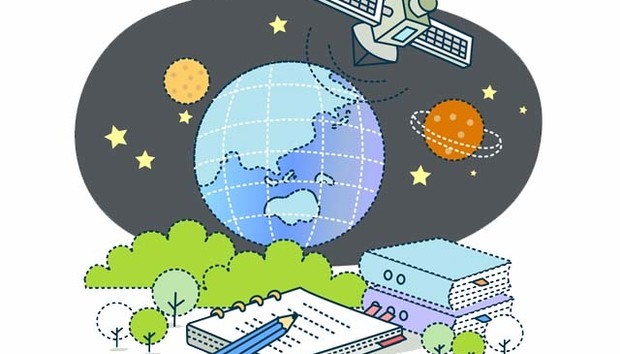 “We believe satellite is the perfect candidate for e-learning connectivity,” said Noah Samara, Founder, Chairman and Chief Executive Officer of Yazmi. “With our system in place the possibilities are endless – lectures can be live streamed from any location, teacher training courses can be offered and having a connected device for multimedia consumption allows teachers and students to access and store high quality educational content. Empowered with Newtec’s multicast gear it is quite unique in the market.” In fact, the project was launched in conjunction with Newtec, a technology company with operations in Europe, while it kick-started its pilot project in Western Cape in South Africa and in India this past October. The satellites will transmit live lectures from anywhere remotely. The tablets will also have the capabilities to facilitate the sharing of digital textbooks and notebooks, education apps and other files. “Teachers can also use the tablet to access live training modules, helping them to be better prepared and more confident in the classroom,” a statement from Yazmi said. These companies seem to be walking away from the traditional provision of information, where a live internet connection is needed. This is an area that Facebook’s Internet.org and Google’s Google Loon are still currently pursuing. Facebook has reportedly been talking to Avanti, a satellite company which owns two broadband satellites across Africa. Google, on the other hand, is looking to launch balloons that will stream the internet to the unreached, with trial plans in New Zealand. “While Outernet has plans to add this functionality in about three years,” he continued. “It is an expensive and difficult problem to solve. Even if you have the right infrastructure in space or in the sky, a cell phone does not have the power to talk back to something in space.” Hence, the need for specialized receivers. The cost of getting internet throughout Africa is something that is seen as one the biggest hurdles for companies. Even for Outernet, cost is still an issue. Currently on the Indiegogo site, the Lantern is going for US$99, cheaper than the original price of US$149. This can still be seen as prohibitive in rural areas. The Outernet network went live in August and had over 5,000 Wikipedia articles ready for download by users. Now 2015 could herald the expansion of such technology across the African continent and in other emerging markets.